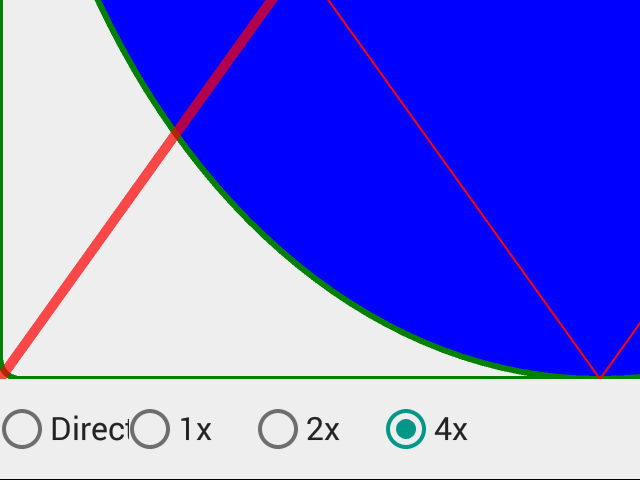 As you can see, the curve of the ellipse and the diagonal lines look jaggy, with no smooth transition or blur between the lines and the colors around them. The image above comes from a sample project where I create an offscreen bitmap the same size as a TPaintBox. Then, I draw the bitmap to the paintbox on its OnPaint event. However, presumably if you are reading this post, you need to use the Offscreen bitmap for various reasons such as its speed efficiency, so what else can we do? Drawing to an offscreen bitmap that is twice the width and height dramatically improves quality which is arguably even better quality than drawing directly to the final canvas. The scale factor can be as large as you want but in practice going above 4x or at the most 8x is unneccessary. Here is the 4x output. The output looks fantastic, but there are downsides. The biggest is that this is a memory intensive technique. Doubling the width and height of your bitmap quadruples the amount of memory you use. Quadrupling the width and height uses 16x the amount of memory over your original offscreen bitmap! However, since this can be a targeted technique, you only have to increase the size of the offscreen bitmaps for the important painting. Another major issue with this technique can be speed. Since you are drawing 4x or 16x more pixels, the offscreen drawing is naturally going to take longer. And then, of course, drawing back to the main canvas adds time as well. However, this is offset by the fact that you generally use offscreen bitmaps for things that don’t change as often and the draw bitmap function can still be much faster than drawing directly to the canvas depending on the complexity of your drawing. The code for the example is here: Super Sampling Example Project. Feel free to use as you wish. Note that the RiverSoftAVG SVG Component Library and RiverSoftAVG IMPACT multimedia instrument package add-on use this technique. There is a Quality property that provides the scale factor for most controls. By default in FMX, when drawing the TRSSVGImage control to a buffer (Buffered=True), rendering the SVG to an image list, or drawing an instrument, the Quality property is 2 which provides a good balance between memory, speed, and quality. Change the Quality property from 1 (no supersampling) to 8 (8x supersampling consuming 64x the memory). The Quality property can also improve the look for extremely small final bitmaps (16×16, 32×32). Since the memory usage is minimal at these small sizes, this property can really help with small bitmaps. That is all for today. Hopefully this tip is useful to some of you. Happy CodeSmithing! This entry was posted in Coding on June 9, 2016 by tgrubb. So I am trying a new thing with the release of RiverSoftAVG IMPACT multimedia gauges and gadgets. RiverSoftAVG.com now has a youtube channel! I have created a short 5 minute video about the product for your information and entertainment. Please let me know what you think, good and bad, as it turned out to be a lot more work than I expected. I want to know if people find these useful or not. If people like them, I might start creating tutorials and other videos. This entry was posted in Coding on June 1, 2016 by tgrubb.